There’s plenty we can learn from how Australia’s men’s soccer team are set up for success. The Australian team chartered a QANTAS plane to take the team home straight after their World Cup knockout tie away to Honduras. At a reported cost of $1 million, it was money well-spent when they were safely on the ground in Sydney while their opponents were still in Departures at LAX. They also had access to doctors, physiotherapists and masseuses during the long-haul flight back to Sydney, as well as some new technology. The “Re-Timer” specs (pictured) are designed to reduce fatigue and help the body adjust to jetlag. It’s significant when you consider that most of Australia’s players live in Europe, and travelled to Central America before returning to Australia. 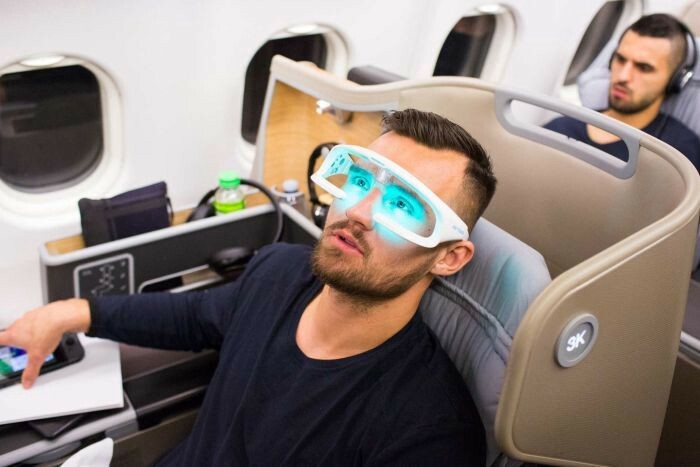 Players were encouraged to wear the glasses and stay awake during the initial 10-hour leg of the journey, before taking them off and sleeping during the second flight from Honolulu to Sydney. Head of Sports Science Craig Duncan (who is interviewed in Where Others Won’t) suggested the sleep patterns, as well as the on-board temperature and meal times to maximize the team’s recovery. It worked, with the Socceroos winning the final leg 3–1 to advance to Russia 2018. The lengths the Socceroos went to to achieve their goal are extraordinary, but also show a commitment to people innovation. Dollars and cents are part of it, but people still win football games. Retailing for $299 CAD, Re-Timer glasses could be a people innovation for your executives or salesforce if they’re constantly on the road. Fatigue and jetlag can affect performance for weeks after travel, so it’s a small price to pay for increased output. Even if they don’t wear them, it shows you care.